Get your hands on the wheel: enter the world of Sparco and rally racing! The ideal 1:1 scale replica wheel add-on for your Thrustmaster collection. 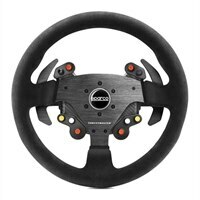 ThrustMaster Rally Wheel Add-on Sparco R383 Mod - Wheel - for PC, Microsoft Xbox One, Sony PlayStation 4Get your hands on the wheel: enter the world of Sparco and rally racing! The ideal 1:1 scale replica wheel add-on for your Thrustmaster collection.